Welcome to The Abso!ute Sound online! We explore music and the reproduction of music in the home. We believe that the sound of music, unamplified, occurring in a real space is a philosophic absolute against which we may judge the performance of devices designed to reproduce music. Our goal is to provide the resources consumers need to judge how a component's sound either honors or departs from the music's truth, and to make sound purchasing decisions that maximize their experience of reproduced sound. Below is our Issue 152, February/March 2005 table of contents and editorial. 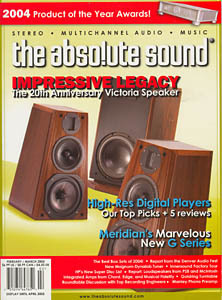 Combining the virtues of a mini-monitor with the bass extension and weight of a floorstander, Legacy's 20th anniversary statement speaker (with ribbon tweeter) is a cause for celebration, says Robert Harley. Our top picks for the best ways to play back SACD and DVD-Audio discs. Our editors choose the very best sounding — and highest value — components of the past year. …and also takes you on a factory tour of this ambitious electrostatic loudspeaker company. Wayne Garcia on Manley's magnificent Steelhead and a sweet affordable 'table from Goldring. Neil Gader reports on this updated version of an affordable high- performance design. Self-professed tube-guy Jeff Dorgay gets a date with this English model. Sue Kraft on Meridian's updated and improved three-piece combo. ...while Robert Harley spins one from Marantz. A further look and re-evaluation by Wayne Garcia. Neil Gader rediscovers the joys of analog (and tube) radio. Yes, that's 500 as in watts! Chris Martens reports. Three of the world's finest recording engineers discuss what goes into making a spectacular recording. Robert Harley moderates. They don't only make electronics — Robert E. Greene on Mac's tall tower. HP updates his Super Disc List, shares some new SACD discoveries, and gives us a sneak peak at equipment under review. Immerse yourself in the more than 120 discs and LPs that are 2004's best boxes and anthologies — the backbone for any music library, says Bob Gendron. Tim Britt recalls the McIntosh MR78 tuner.